Hello, Dr. Dike Drummond Tearing, Physician Burnout Basics video number three. In this video, we'll talk about the pathophysiology of burnout, how it works inside the bodies of its victims and I'll show you the two main ways to prevent it. First of all, let's get rid of a metaphor that doesn't really work. Have you ever said to yourself my batteries are run down, I just need some time off to recharge? Almost everybody uses that metaphor, I'm going to encourage you to stop it because it really doesn't work. 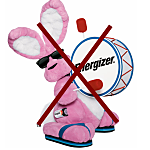 I mean imagine this, imagine the Energizer Bunny is right here in the room with us, pounding his little drum and walking across the floor, what happens when his batteries run out, what does he do? He stops, right. Well, since when did you ever stop and I mean ever stop? For all of us who take care of patients in the course of our workday, we have been trained and conditioned by our educational process to continue to work despite the fact that our batteries are completely empty. Let me give you a better metaphor, one that makes complete sense once you've seen it here it is. So rather than think about this as a battery that's rundown, let me show you an energetic bank account it's just like an account at your bank that holds money, but this account holds your own personal energy. It has a positive area zero line and there's a place where you can go into a negative balance. Let me ask you this at the bank if you over draw your account, do they close it? No, they don't, what they do is they charge you fines and interest; they actually accelerate your downward spiral when you go below zero, that's true of this account too. When your energy level goes below zero, it accelerates your downward spiral as well. If you look at this account, I want you to know that all good things come when you have a positive balance of energy. When you have some energy available to you that you can give to other people, whether that's your patients, your co-workers or your family members, your children, all good things come from a positive balance. And that leads to the one ethical thing that we all have to take care of, it's our own energy balance. You have to maintain a positive balance or you have nothing for anybody else. 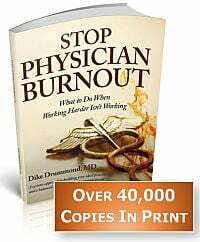 Physician Burnout’s first rule is very simple, “you can't give what you ain't got”. I'm going to say that again, “you can't give what you ain't got”, if there's no energy there, you have nothing for patients, your co-workers or your family. 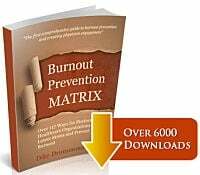 Now, you can think of this as just one energy account but it helps to actually know that there are three of them and the three accounts correspond to the symptoms of the Maslach Burnout Inventory that we discussed back in video number one. Let's go through them one at a time and I'll show you how you can make deposits in these energy accounts. Remember that the first symptom is exhaustion. Exhaustion corresponds to a physical energy account and if you were going to make deposits into your physical energy account, what would you do? Right, get some sleep, some exercise, eat good food. They did not teach us how to do that in their training programs, right? All of our faculty members were great examples for us weren't they? Yeah, well I know they weren't. We didn't eat good, we didn't sleep well, we didn't get exercise, is this something you have to learn now and it's how you put deposits into this energy account. That's number one. Remember symptom number two is being cynical, sarcastic, compassion fatigue that corresponds to an emotional energy account. You have to have some emotional energy in order to be present emotionally for somebody else. How do you make deposits into this account? Well, I found that the quickest way to do that is through relationships, through spending an appropriate amount of time with the people who are most important to you in your life: your spouse your significant other, your children, yourself, your family members, how long has it been since you've been on a date night? This is important stuff. Energy account number three corresponds to that symptom of what's the use, my work serves no purpose. And I call this energy account your spiritual energy account, not a religious practice but if you have a religious practice that comforts you, please keep it up. I'm talking about your spirit being fed by having experiences of connecting with your purpose. And let me invite you to remember that patient again, remember that experience, how was your energy for the rest of that day after that encounter? I bet your physical and emotional energy went up too, I call it a triple whammy. And remember too you don't just connect with your purpose at work, there's all sorts of things outside of work in your larger life that connect you with your purpose. Like for instance, I used to love coaching my kid’s soccer teams. So if you're not having a regular connection with purpose at work and at home, you've got some energy that's missing from this spiritual energy account. Spiritual ideal patient encounters connecting with purpose both at work and at home. And once you understand these energetic bank accounts, you realize really quickly there's only two ways to prevent burnout. It's very simple. You either lower the drain of the stresses of your work life and your larger life or you increase your ability to recharge. Your job is to maintain a positive energy balance because you can't give what you ain't got. How do we get started? Well, here's a saying I'd love for you to learn. It goes like this, “the beginning of all change is calling things by their right name”. And what I know is that you like me have been trained to ignore your stress levels, to ignore when your energy accounts drop below zero but it's part of what our training programs are. So right now I invite you spiritually, emotionally, physically just notice your energy levels right now. And whether it's positive or negative, it's not good or bad it just is what it is. But unless you begin to notice the things you were trained to ignore, your energy levels, how you're doing, how you're feeling unless you begin to notice these things, we can't begin to affect them, we can't begin to manage them intentionally. So take a dig deep breath in with me right now and just notice, where are your energy levels? How are you doing? That's how we get started. Well, that's the end of video number three. In video number four I'm going to show you the four causes of burnout. 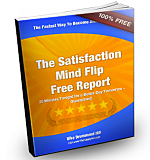 The four main causes of stress that drive down the balance in these energetic bank accounts. I'll see you on the next video.